After almost 20 years of this 90s manga (and anime) languishing in production purgatory, director Robert Rodriguez finally brings us Alita: Battle Angel. Based on Yukito Kishiro’s Gunnm series, Alita: Battle Angel brings us the adventures of a young amnesiac cyborg girl, fighting her way through a ruined future. It is the 26th Century, 300 years after the fall. Discovered on a scrapheap by cyberneticist Doctor Dyson Ido (Christopher Waltz), beneath the one remaining floating city on the ruined Earth, Alita (Rosa Salazar) is unable to remember anything of her past, or where the advanced technology of her damaged cyborg body comes from. Repaired and adopted by Ido, Alita aches to explore the new strange world of Iron City that she has come to. However, besides the wonders of new friends, and exciting sports, there is also the dangers of cybernetic organ jackers, and something even more sinister that has already claimed the life of many of the city’s residents. Soon Alita begins to question not only her adopted father’s laws, but those of the bounty hunters, the so called Hunter-Warriors, that serve as the only means of justice in the factory run town. Fortunately her own past has not left her unprepared for battle. Cleaving close to the spirit of the manga, albeit not to the precise letter of the story arc, Alita: Battle Angel is an ambitious attempt at storytelling. However in its attempt to cover so much ground and set the scene for the following adventures of Alita, representing years of manga issues, Alita: Battle Angel is also a vastly overstuffed work. As such the film covers not just the world building to get audiences up to speed on the world of the 26th Century, but also covers numerous arcs from the series – the Hunter-Warriors, a romantic arc, Motorball, Alita’s origins. It’s a lot to take in, and where you can admire Rodriguez for going for broke, a bit of restraint in paring down these multiple elements would have lead to a shorter, more focused film. That clipped nature of storytelling also comes through with the dialogue, making a lot of it seem perfunctory as the film rushes from one plot point to the next. 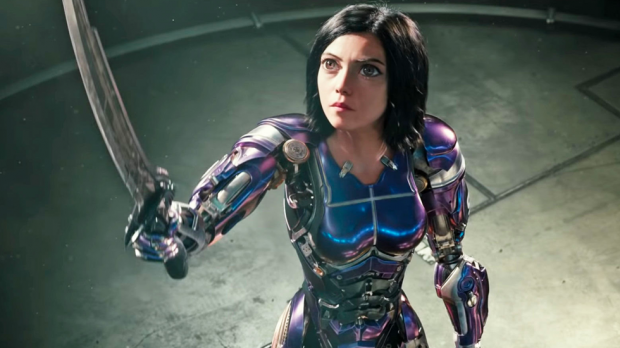 The overall effect is that Alita: Battle Angel seems a little flat in terms of relationships and stakes, despite the vastly emotional elements in the story-line. There is promise there, especially with the Alita/ Hugo romantic arc, but it never quite reaches its potential, despite some great work from the actors. However there is also a lot to admire here. Rodriguez has vividly brought the world of Iron City to life, with its mixture of salvaged technology and cybernetic inhabitants. There is almost a slavish devotion to the visual fidelity of the work (such as the character design of Alita), and there are times you are stunned as a frame of the manga leaps off the page rendered in vivid detail. This is certainly an effects driven extravaganza, but one that genuinely deserves that oft bandied title, as it does amaze and entertain. Weta Digital definitely earned their pay cheque with this one. Similarly the actors manage to bring a lot to their characters, despite being laden with lumpen dialogue. Rosa Salazar (the Maze Runner series) breathes life into her digital avatar, following Alita’s wild swings between wide-eyed naive innocent and fierce berserker. We never question this vast transition, as Salazar makes us believe it every step of the way. A phenomenal feat, when you consider it’s being done through that added layer of motion-capture, and digital effects. You soon forget the extraordinarily large eyes, and instead only see the young character in front of you. Hence, despite being a bit of a mixed blessing of a film, Alita: Battle Angel does have one extraordinary effect on the audience – it leaves you wanting to know what happens next. As such it feels a little unfinished in that regard, with all the vast potential of a series of films stretching out in front of it. What we are left with is a fun, slick, adventure film that feels achingly incomplete, but we are at least wishing for more.